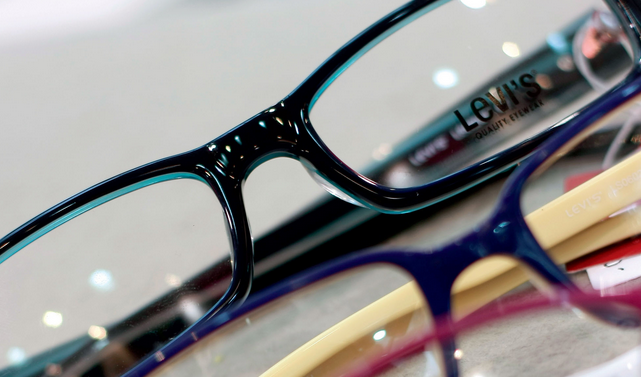 This doctor-entrepreneur provides a new twist to a four-generations-old eyewear brand. The Sarabia family has been in the optical-shop business for over a century, running it for four generations now. But Dr. Vivian Sarabia, a third-generation scion of the Sarabias, realizes that even with a prestigious name, a business can ensure its continued success only if it has a long-term vision. Thus, in 2003, she thought of adding a strategic twist to the Sarabia brand. Having a personal knack for fashion and styling, she shifted her shop’s focus from simply providing eyeglasses to eyewear styling, in the process making herself the first and only eyewear stylist in the country. With her newly created market niche, she added her first name to the Sarabia brand to distinguish her optical shops from the other Sarabia Optical shops. Today, there are now six Vivian Sarabia World of Optics branches in Metro Manila, with a team of three optometrists assigned to each branch. “This is the world we all grew up in, and what we’re doing is just enriching it, improving on it, and evolving in it,” she explains the business initiative she had taken. Vivian is so passionate about the business that it has become second nature to her to dish out eyewear advice even in the middle of a party. She says that such attention to detail is what sets her brand apart from the competition. Indeed, Vivian Sarabia has designed eyewear for so many of the country’s top leaders and celebrities, including President Gloria Macapagal Arroyo. This has made people in the know informally give her the title of “queen of optics,” but she is not content with just that. She continues to be strongly hands-on in the business, making it a point to continuously update herself on the latest in eyewear styles. Vivian Sarabia is following a tradition among the members of the Sarabia family to put up optical shops of their own. 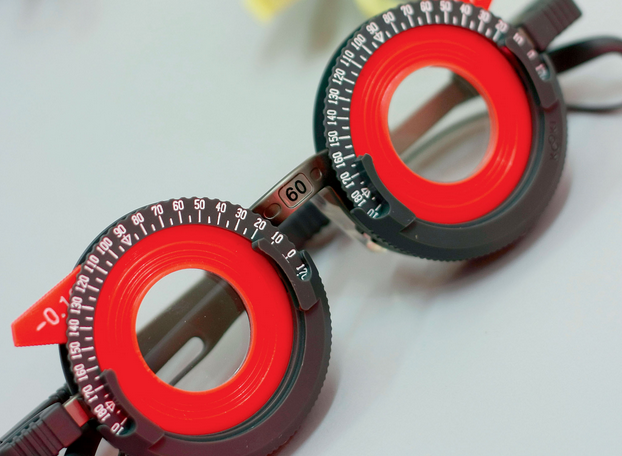 The original Sarabia Optical itself was set up in 1906 by her grandfather, Dr. Federico Sarabia, whose first customers were the affluent families of the day. Today, there are nearly 50 Sarabia Optical branches nationwide, and there are 36 optometrists and ophthalmologists in the family’s third generation alone. To help the Sarabia family carry on with its business, she recalls how she used to attend to eyewear patients even while babysitting her children. Indeed, like most scions of the Sarabias, her three sons would stay in the optical shop during their playtime, and would later work in the eye clinic as their mandatory summer job. 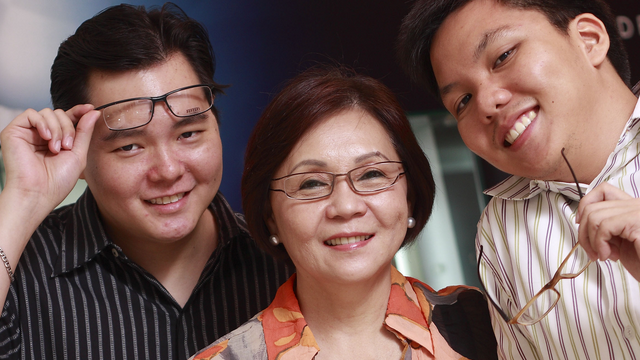 Today, her sons hold key positions in the company: Dr. Francis Sarabia-Ong handles operations; Brian, the eldest, handles finance; and Jan Vincent, the youngest, handles marketing. Francis says: “The optical business comes naturally to us because it was not something that we were pressured to learn in a couple of years. It’s something that came to us over the course of our lives. When you do something long enough, it becomes something of a reflex to you.” He says that the challenge for the fourth generation of Sarabias is to be more creative and to ensure that their product standards and services remain top-notch. Vivian Sarabia says that aside from the greater sense of respect and higher level of trust involved when family members do a business together, it is the least stressful and easiest way to do it. “It’s easier to work with the people you love,” she says.